Camping Vallée de la Sélune är en camping i Pontaubault, Manche. Campingen har platser med stängsel och platser med lite skugga. Det finns möjlighet att hyra husbilar. På campingen finns en lekplats. Denna inspektör gör varje år ett besök på Camping Vallée de la Sélune och inspekterar campingen för ca 200 faciliteter och för andra förekommande punkter. Inspektören är en medarbetare från ACSI och arbetar inte för campingen. This is a small British owned site with sloping grass pitches around a circular grass area, there are several statics in the lower part of the site. It was difficult to find a flat pitch and levelling blocks would be needed. The centrally positioned toilet/ shower facilities are dated but clean; no toilet paper is provided. There is a riverside walk nearby with a five minute walk into the village. The village has an interesting monument to nearby battles of WW2. We visited in low season. There is a marked cycle path to Mont St Michel. Lovely, quiet, small site. Excellent host. Great location in a nice village within easy cycle or drive to Mt St Michel and Avranches. Not the campsite but beware that the ASCI app does not send a booking request, even though it says it has done so. From one Yorkshireman to another, what a friendly and welcoming site. Thank you for the hospitality during our stay, this was definitely the friendliest site we stayed on during a 6 week stay in Normandy and Brittany. Nothing was too much trouble on this site, the owner was always available and not hard to find if he was required. We borrowed a map (well used) one day as we went out cycling, it was very useful and we had been advised which way to go to keep clear of the main roads. We easily cycled to Mont St Michel and had a good look around, took a different route back (made possible with the assistance of the trusty map). The site was easy to find from the directions in the ACSI book. Pitches were easy on and off. The facilities were kept clean and tidy and there was plenty of hot water in the showers. The cubicles were reasonably sized with hooks to hang towels etc..
All in all a super site, no frills but we are camping! Don't be put off by the entrance, this is a charming family run site with excellent facilities in a small village with nearby shops, a supermarket nearby and only 10 minutes from Avranches. The owners are incredibly welcoming and friendly (even though he's from Yorkshire) and like nothing better than a drink and chat with their visitors. Vill du boka Camping Vallée de la Sélune eller få mera information? Det går bra med nedanstående uppgifter. 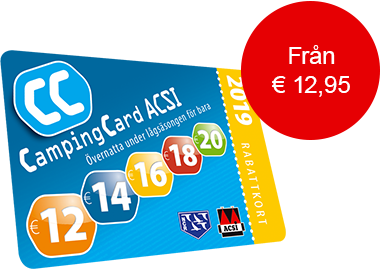 ACSI Eurocampings skickar din informationsförfrågan till "Camping Vallée de la Sélune".